FIFA 18 is out at September 29 on Nintendo Switch, and EA Sports has confirmed that FIFA 18 on the Nintendo Switch will run at the maximum available performance levels, which is full-HD (1080p) at 60fps when docked, and HD (720p) at 60fps in portable mode. “We spent a lot of time actually understanding what the console is. In dock, what we’re seeing right now, for example, is 1080p running at 60 frames per second”, Andrei Lăzărescu, the supervising producer for FIFA 18 on the Nintendo Switch, told NintendoEverything in an interview at Gamescom in Cologne on Thursday. Until now, fans were wary that FIFA on Switch would be hampered by its comparative lack of power against PS4 and Xbox One. But it seems that EA’s decision to rely on the older engine – Ignite instead of Frostbite – has allowed it to eke out better performance. 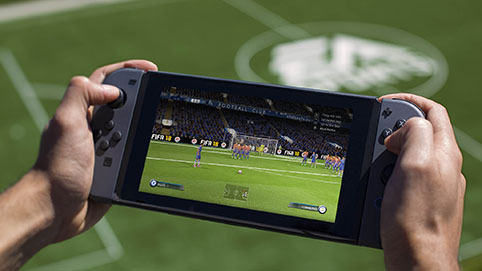 The lack of Frostbite does mean that Switch players won’t have access to The Journey mode, starring fictional footballer Alex Hunter, as the cutscenes are entirely driven by the new game engine. We still don’t know how long the Switch’s battery will last while playing FIFA 18, though. For comparison, a heavy-duty title such as The Legend of Zelda drains the Nintendo console in about three hours. FIFA 18 launches on Nintendo Switch, PS4, PS3, Xbox One, Xbox 360, and PC on September 29. mmocs.com will update the FIFA 18 news and guides, and cheap FIFA 18 Coins. Any questions about FIFA Coins, contact our LIVE CHAT 24/7 online as soon as possible.